Gideon Gee-Bum Kim’s music draws on his Christian faith and shows a connection of the rich musical heritage of Korea and new compositional techniques, especially in the field of heterophony texture and all of this with live and emotional imagination. Born in Seoul, South Korea, Kim received his B.A. in music composition from Seoul National University and his M.A. and Ph.D. in music composition from the University of Pennsylvania. His mentors included George Crumb, Mark Kopytman, and Young-ja Lee. Crumb described him as a composer who shows great originality in use of rhythm and harmony, and possesses a fine melodic gift. As a numerous awards, fellowships, and honours winning composer, Kim's works have been performed regularly in concert halls, festivals and music worships in Europe, North America and Asia by many leading soloists, ensembles and orchestras. 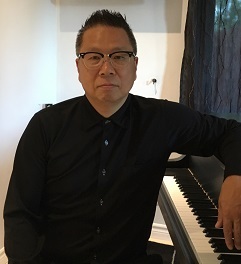 Kim is a former associate professor in music composition at Kyungwon University and currently is an associate composer of the Canadian Music Centre which has highlighted his music since he moved to Canada in 2004. In 2000, Kim was a Distinguished Composer-In-Residence at Colorado College that honoured him with all-Kim concert of performances of various chambers and solo. In 2011, Kim founded the Toronto Messiaen Ensemble, a Canadian chamber ensemble dedicated to the performance of classical and contemporary music and he currently serves as artistic director of the ensemble. As a long standing partner of Jerusalem Kaprizma Ensemble, Kim’s works have been performed and recorded by the ensemble and are available for listening and downloading at the ensemble’s web-library. His music has been published by the Canadian Music Centre and Yedang Publisher, and can be heard on Sony Classical, Synnara Music and Sung Eum Limited labels. As a conductor, Kim has directed several musical ensembles in Korea and Canada including the Amabile String Orchestra at Seoul National University, the Yemel Philharmonic Chorus, and the Toronto Messiaen Ensemble. He also appeared as a conductor in various concerts and professional reading series in Israel, United States, Canada and Korea with leading ensembles like the Jerusalem Kaprizma Ensemble, Curtis Chamber Players in Philadelphia and Ensemble Mise-En in NYC. • Two movements on the theme of "Angry Birds"